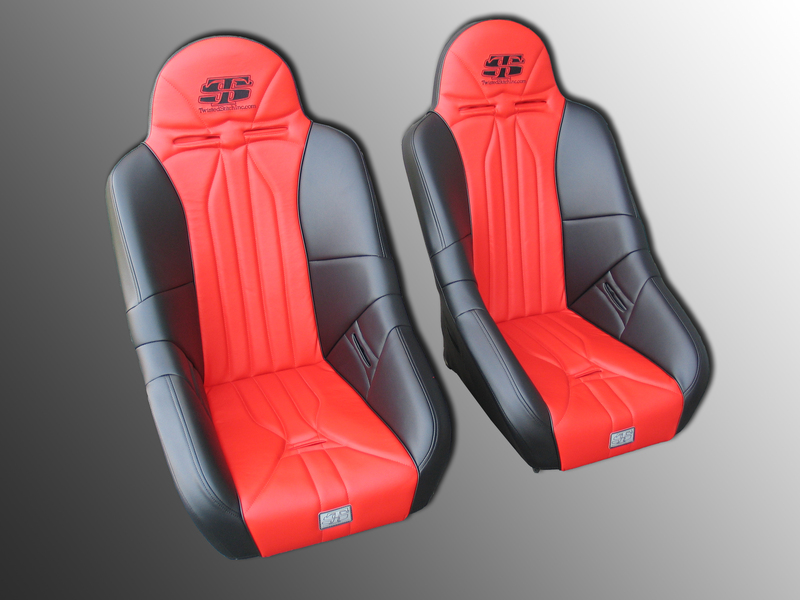 Seats So Good You'll Want to Design a Whole Rig Around Them !! 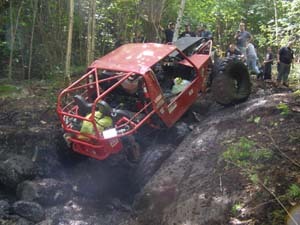 Often frustration leads us to do dumb things we later regret - it certainly has with me - more times than I care to admit. 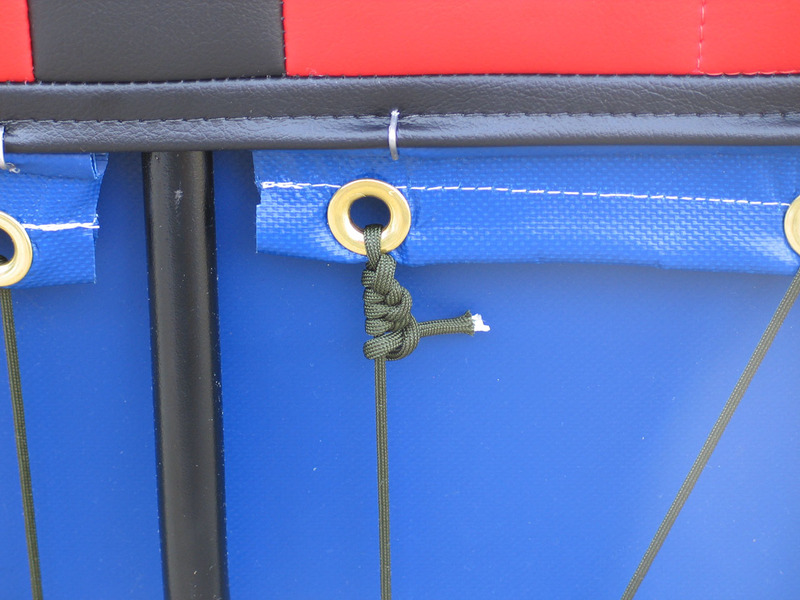 Every so often, however, frustration can lead to an unexpectedly awesome result. 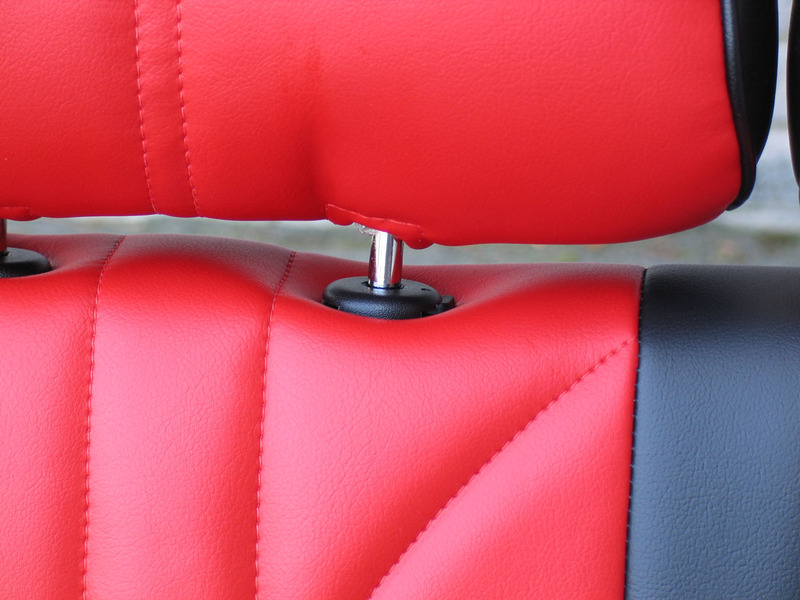 This article is a story about just such a rare occurrence. 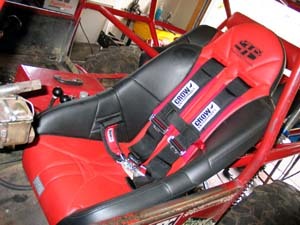 I had gotten really fed-up with the seats in my rig. 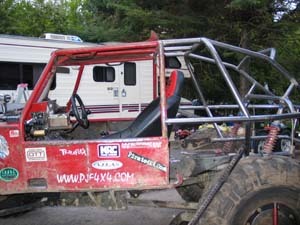 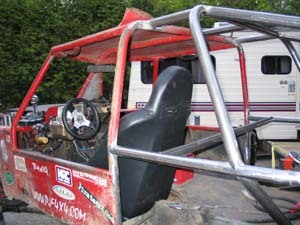 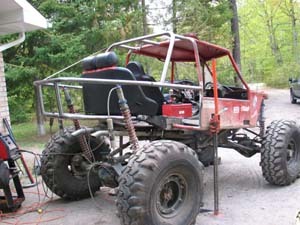 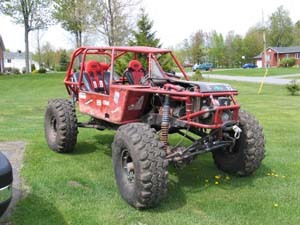 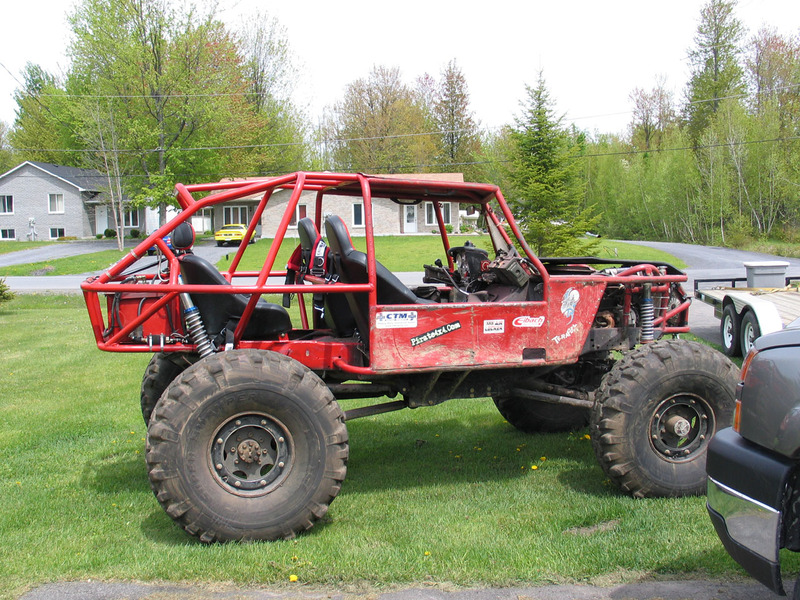 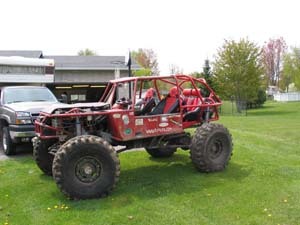 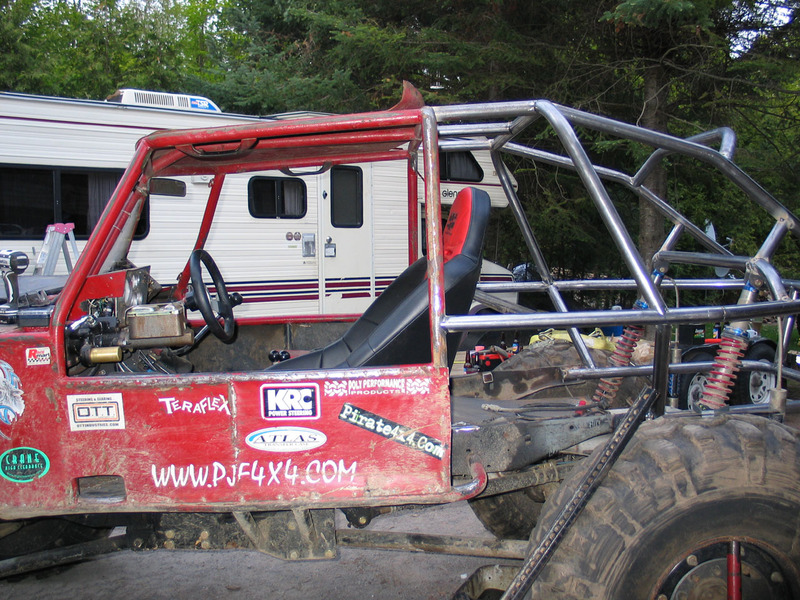 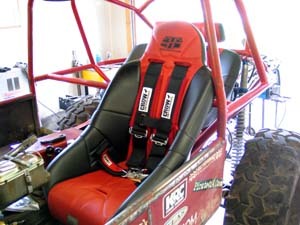 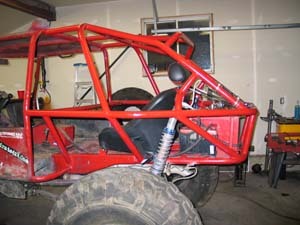 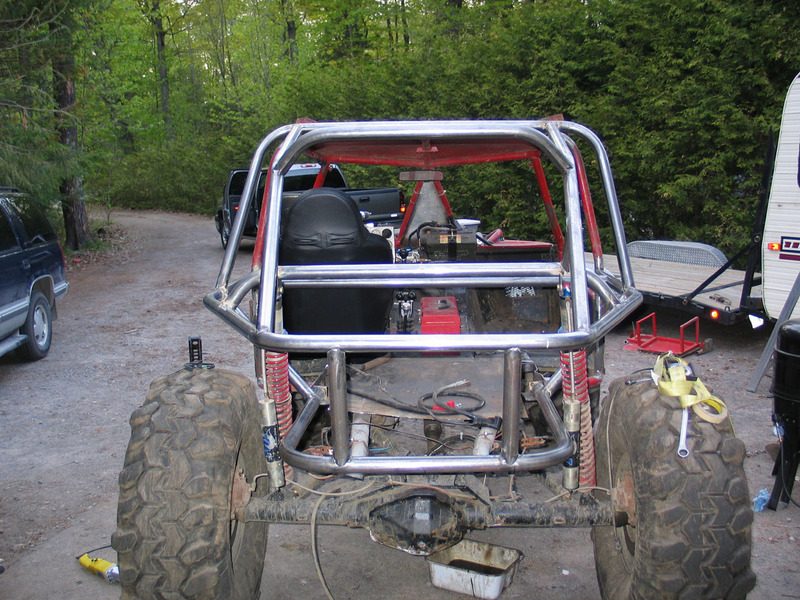 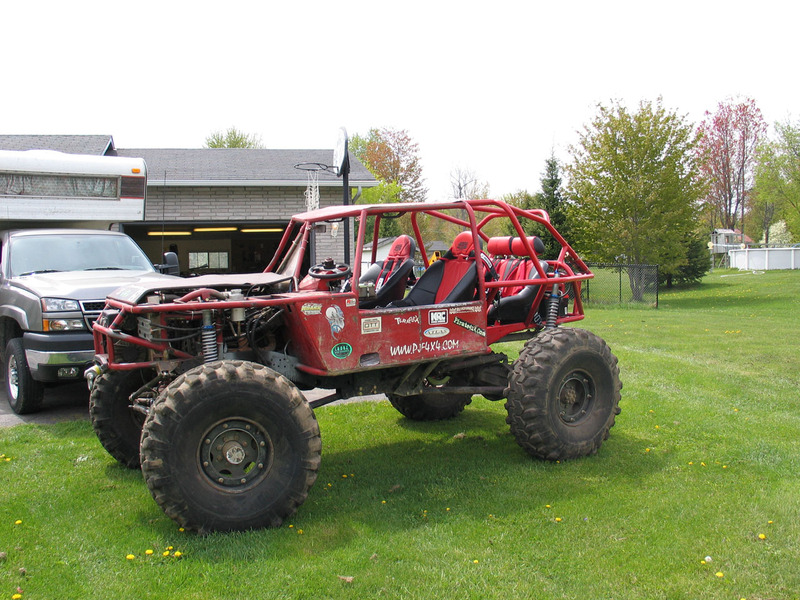 I had tried junkyard seats and "cheaper" off-road seats - no matter how well the rig worked I couldn't get comfortable. Worse - Laurie's seat was an unmitigated piece of crap and she reluctantly admitted she not only wasn't comfortable, but didn't feel very safe. I had tried different seats in keeping with my "built on a budget" nature. 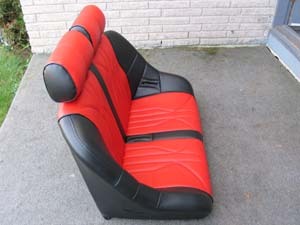 I had tried sliders and reclining mechanisms - all to no avail. 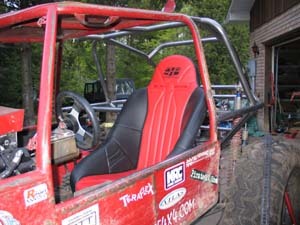 Not only that, but the kids, growing like weeds, were fast outgrowing their kid-sized bucket seats in the back. Finally, there were those occasional times on the trail when I really wished I could fit an adult in the back - even for just a short spell, and that simply wasn't possible with the old setup. Something HAD to be done! Finally, in total frustration, with a deep breath and a shaky hand on my CC I called up Dave at PolyPerformance and let it all out... "Dave", I said, "I've had it with these seats and mucking around trying to get things to work. 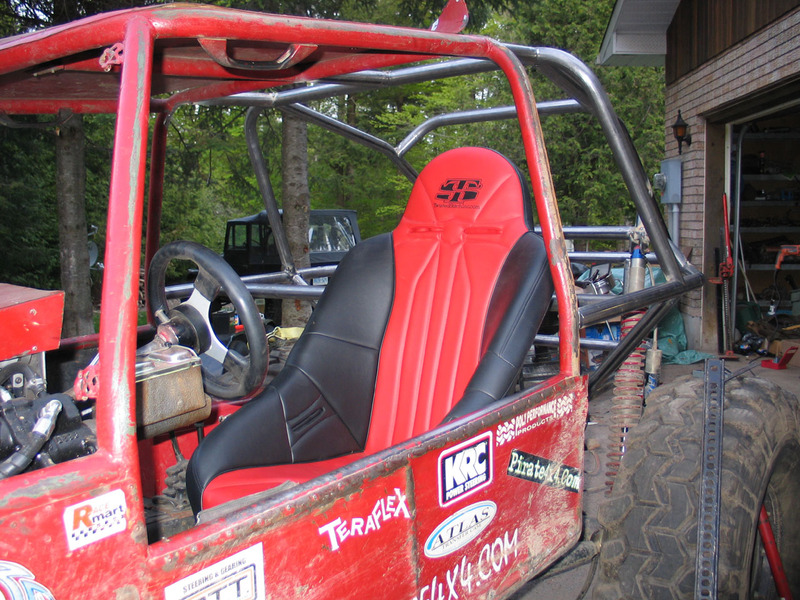 I don't care what it takes - give me a price on the best seats you can get, Beard, Mastercraft, whatever..."
To my surprise, Dave said, "Hold on, not so fast. 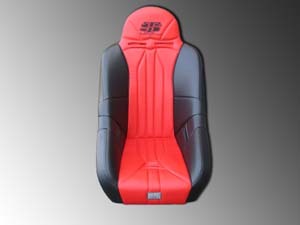 There's a new player in the seat game I really think you should check out." 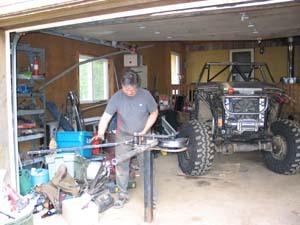 He went on to tell me about a company called Twisted Stitch Inc who had recently started making top-quality suspension seats for the off-road, sand-car, and side-by-side markets. "What the heck? 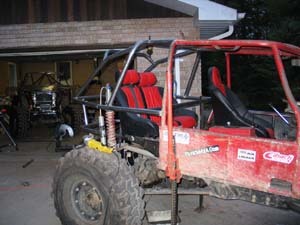 ", I thought. 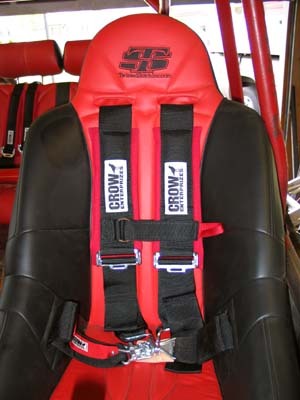 I've trusted Dave's judgement in the past and never been disappointed, and this new company didn't spring from nowhere - it was started by a staff with a combined 35 years experience in the suspension seat business. In short order I was talking to Chris Cahill at Twisted Stitch. 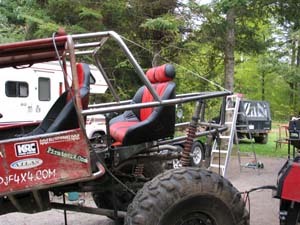 He explained to me who they were and what they do and we spent some time going over their extensive line of products and the many custom options available. I'll get into more detail on this shortly, but the short story is: these guys will gladly build you just about any seat you can dream of, in any size, colour, or configuration. 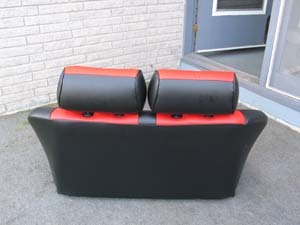 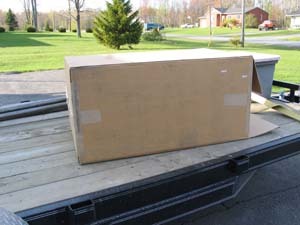 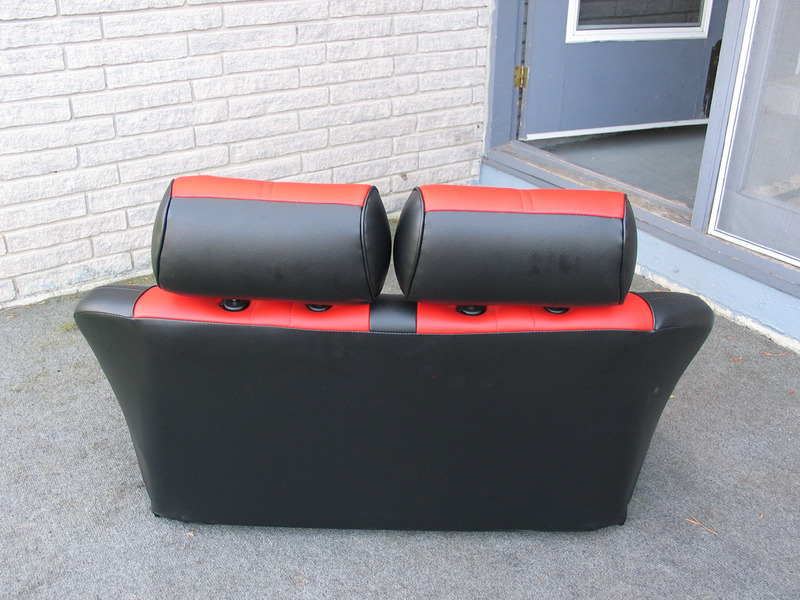 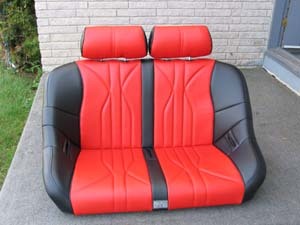 For the rear I chose a custom bench seat based on the Rhino side-by-side rear bench platform. 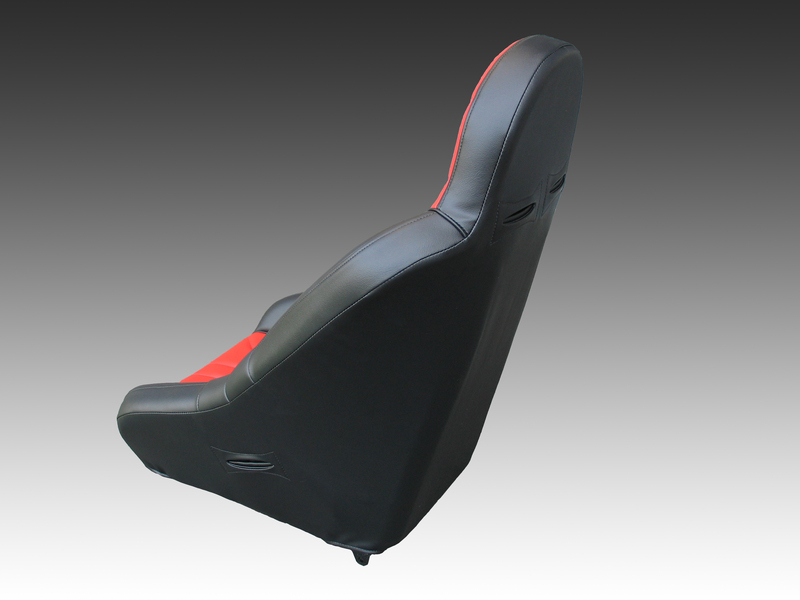 This means the seat-bottom length from the back to the front edge is shorter than a full-size seat, which is perfect for maximizing leg room in a compact buggy. 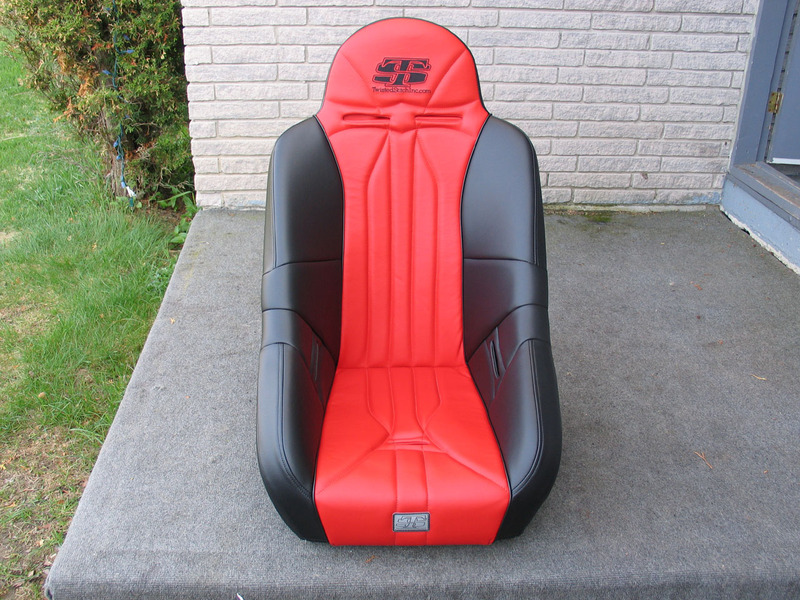 I ordered mine in a custom width of 40" with adjustable headrests and no sub-belt slots in the seats (to keep sand, mud, and gummi-bears from infiltrating the seat with the kids back there). 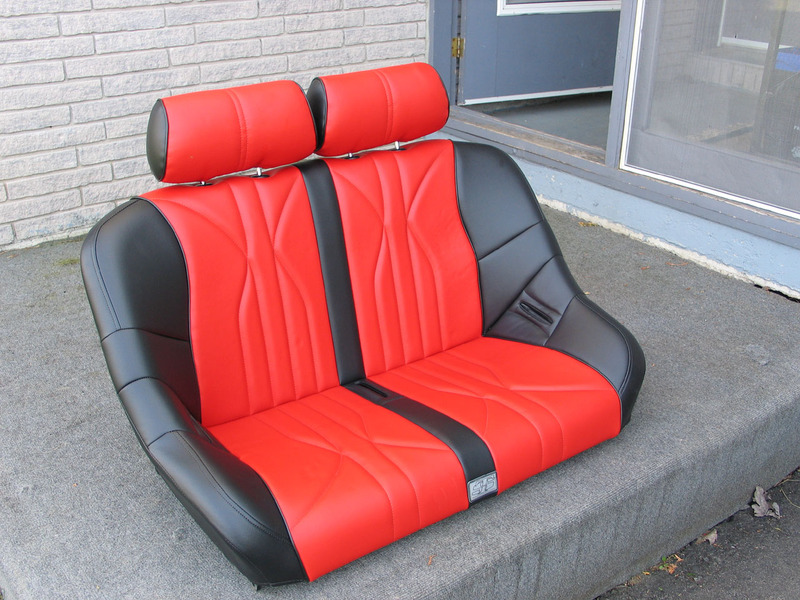 The shoulder harnesses fit between the top of the bench and the headrests. I chose all-vinyl for its easy clean-up and black/red to match my buggy's colour scheme. 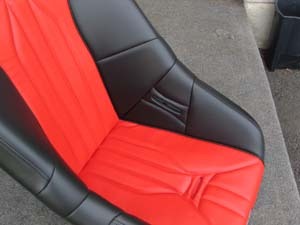 Chris suggested the centre black stripe to give the sense of individual seats for the kids and I think it looks awesome. 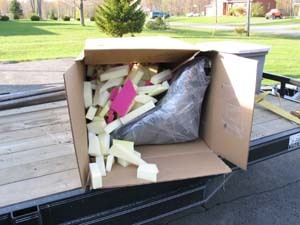 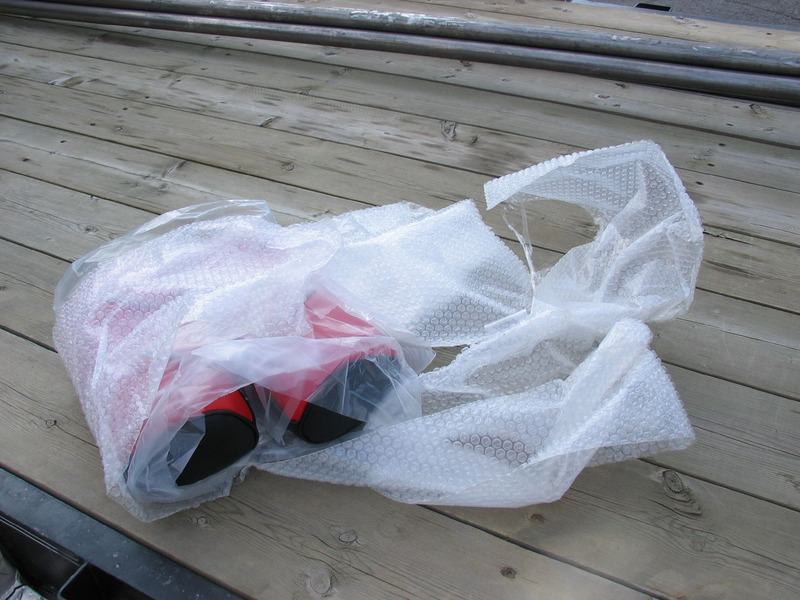 ... the bench was well protected during shipping by a ton of loose foam bits. Of course the giant box and multi-coloured bits of foam kept the kids occupied for hours! 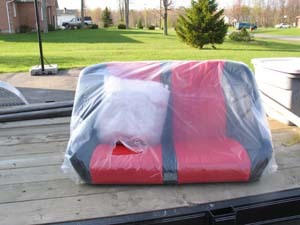 Inside the bench was fully wrapped in plastic with the headrests packed individually. 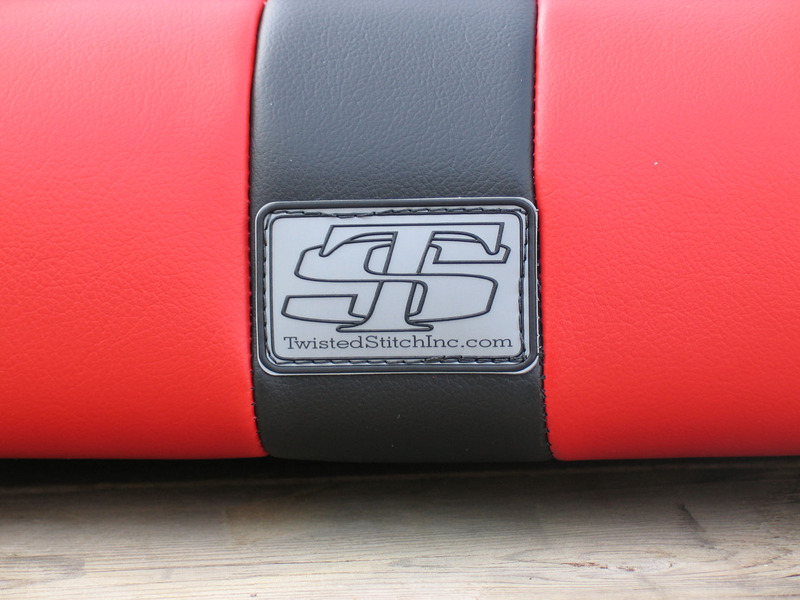 The cool Twisted Stitch logo sewn onto the front edge of the bench. Unpacked bench without headrests attached. 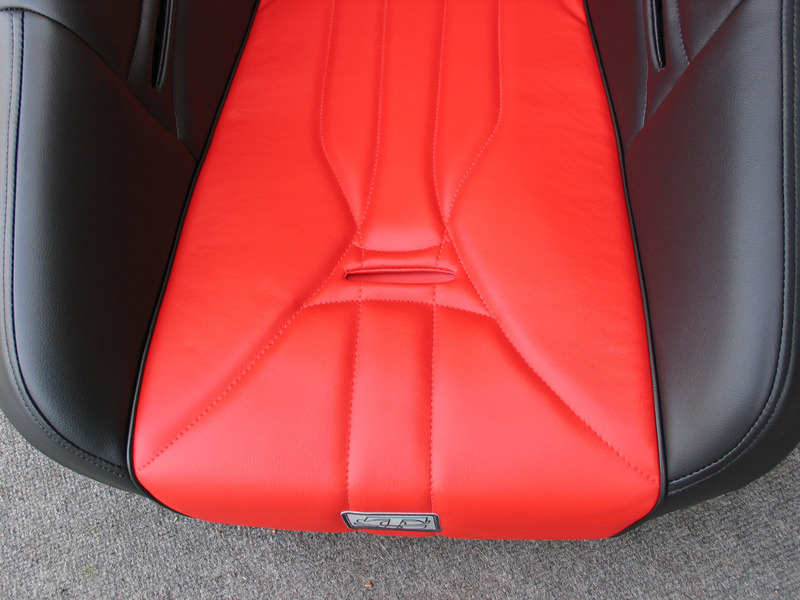 Underneath the superb build-quality and workmanship are evident. 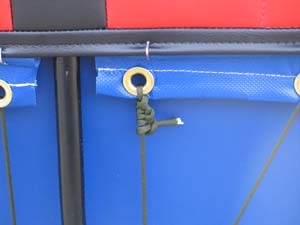 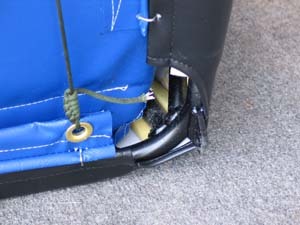 Close-up of reinforced grommets and rope work. 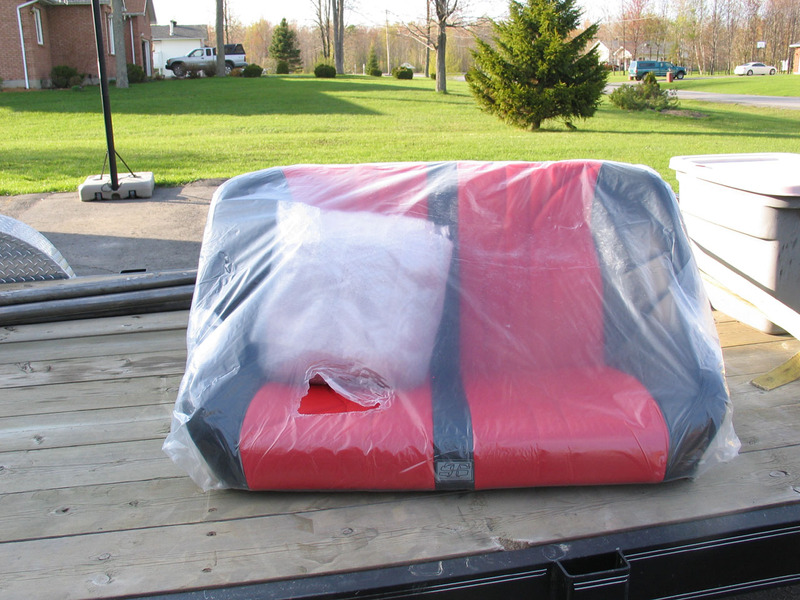 The headrests were packed in bubble-wrap. 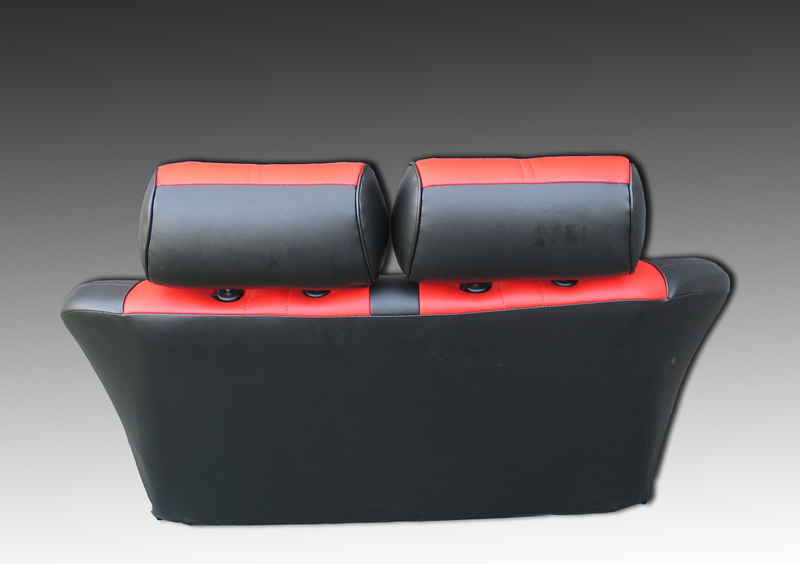 The headrests are individually adjustable for height, and also tilt. 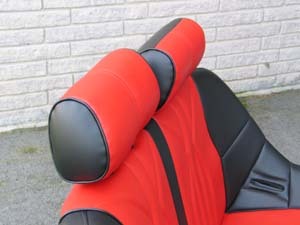 Close-up of the range of tilt on the individual headrests. Rear shot of the bench. 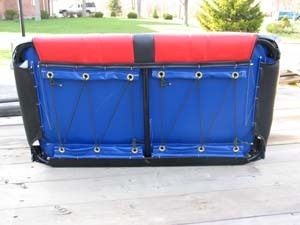 Side shot of the bench. Note the high side bolsters and the lap-belt slots. 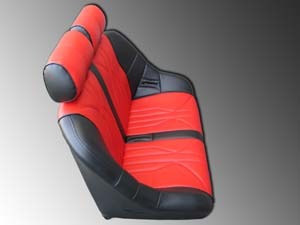 It's hard to convey the quality of the look and feel of these seats in digital images. 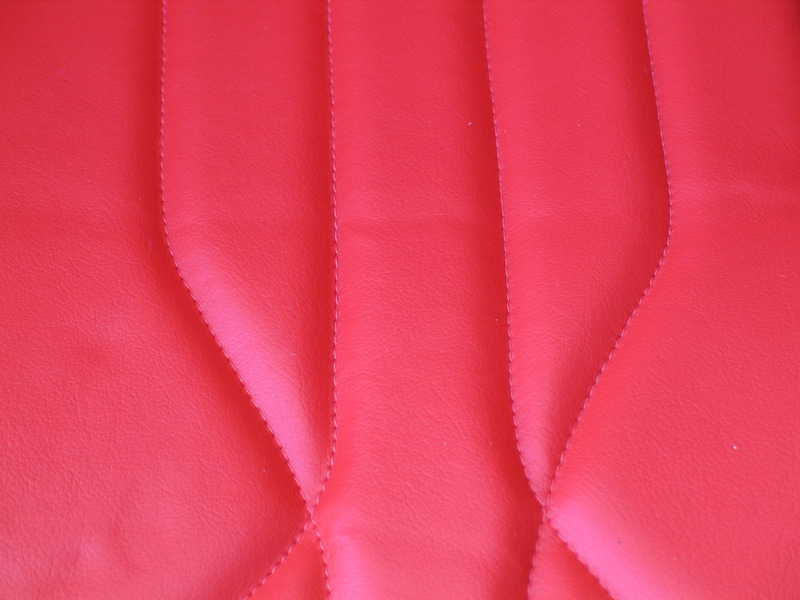 The stitching is perfect, the vinyl is heavy yet soft to the touch, and the colours are super-bright. 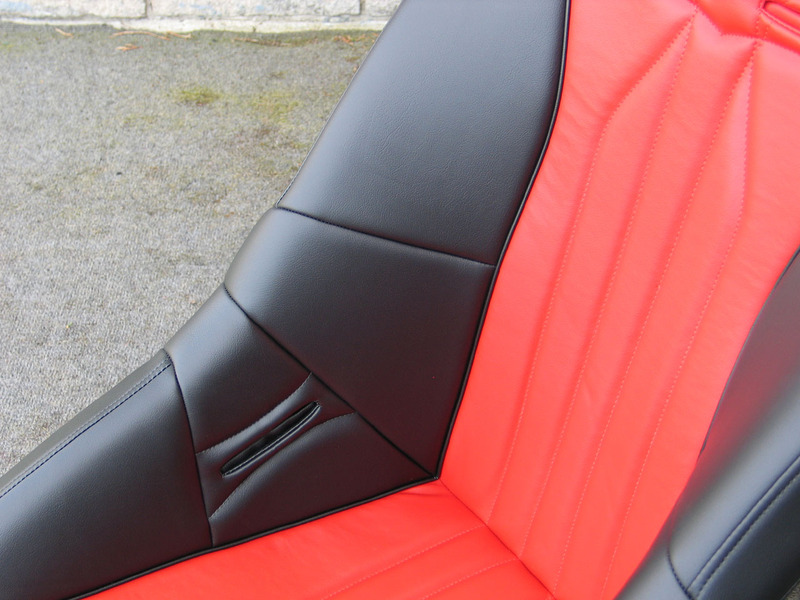 The centre stripe in a full-width bench is normally 5" wide, but because of the narrow width of my bench Chris custom-made the stripe 2" wide - the effect is very cool! 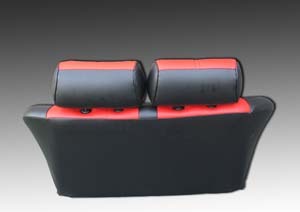 Headrest with locking tab on seat back. 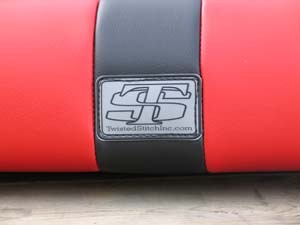 Front edge of bench with Twisted Stitch logo. 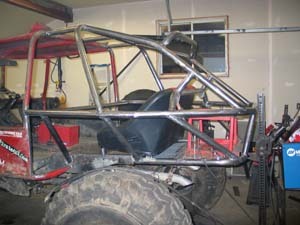 Fully welded tubular steel frame. 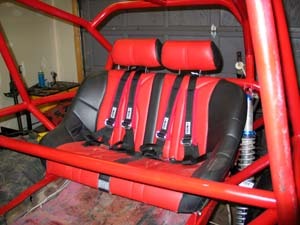 All the seats mount with a 3/8" bolt. 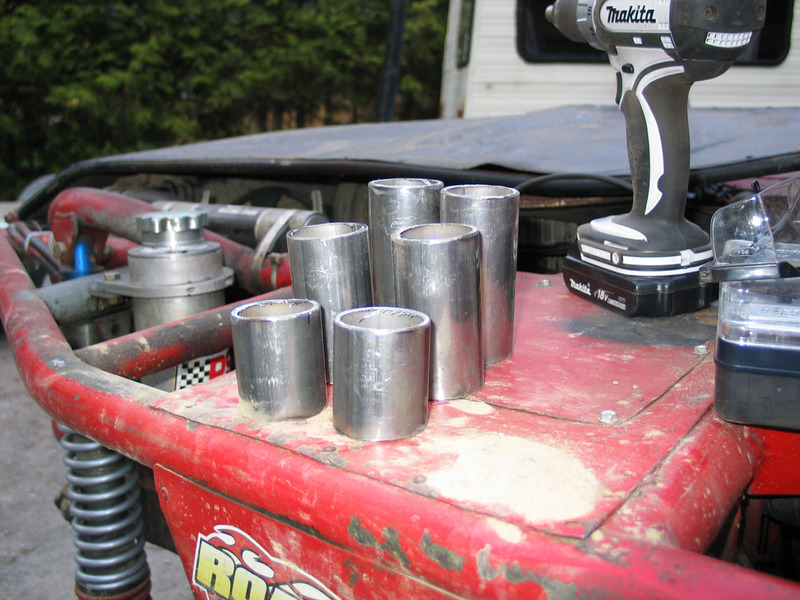 I used my normal preference for mounting hardware - Grade 8 fine-thread bolts (1" long is perfect) combined with all-metal locking nuts (deformed thread or "Stover" style). 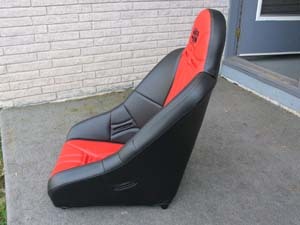 For the front I chose the Twisted Stitch Pro competition suspension seat. "...a high-containment competition suspension seat with a high-sided bolster design, integrated sub, lap, and shoulder-belt slots and a fixed headrest. 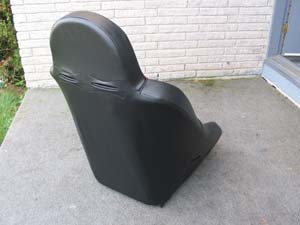 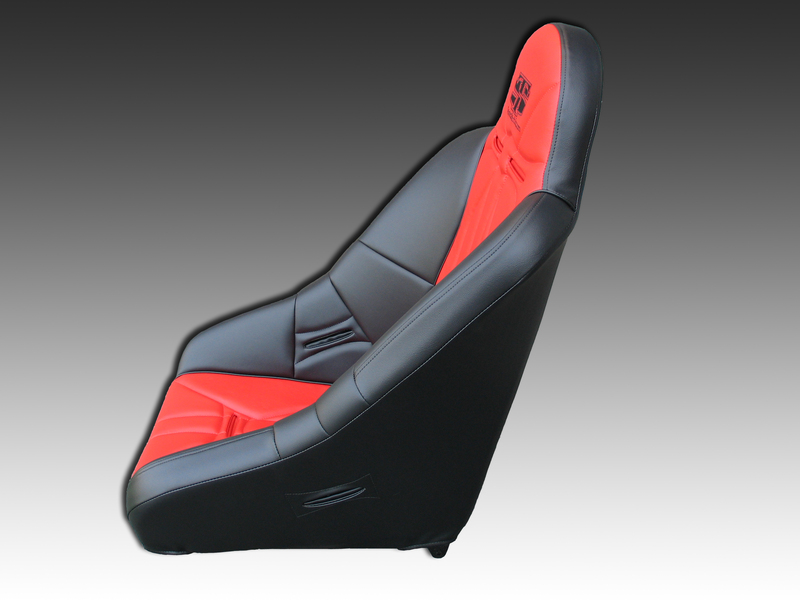 This is the ultimate seat for aggressive terrain or racing applications. 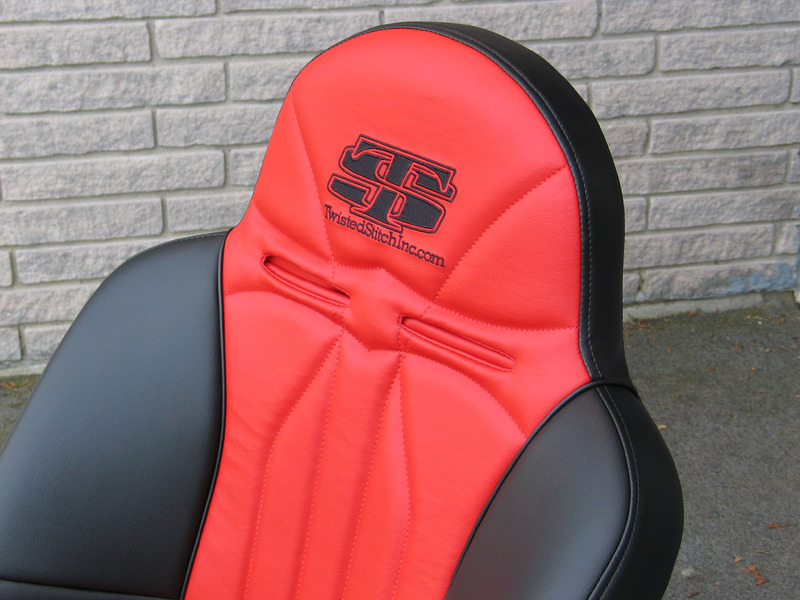 Like all Twisted Stitch seats, the Pro utilizes multi-density foam designed for support and comfort, and comes in an array of custom colours manufactured with only the highest quality materials." I describe it as freakin' awesome! 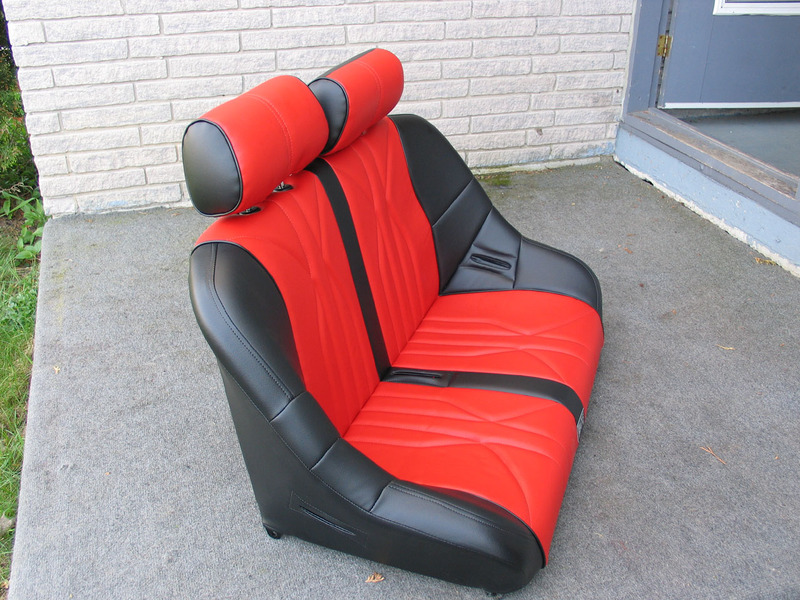 As with the bench, the fit and finish is top notch. 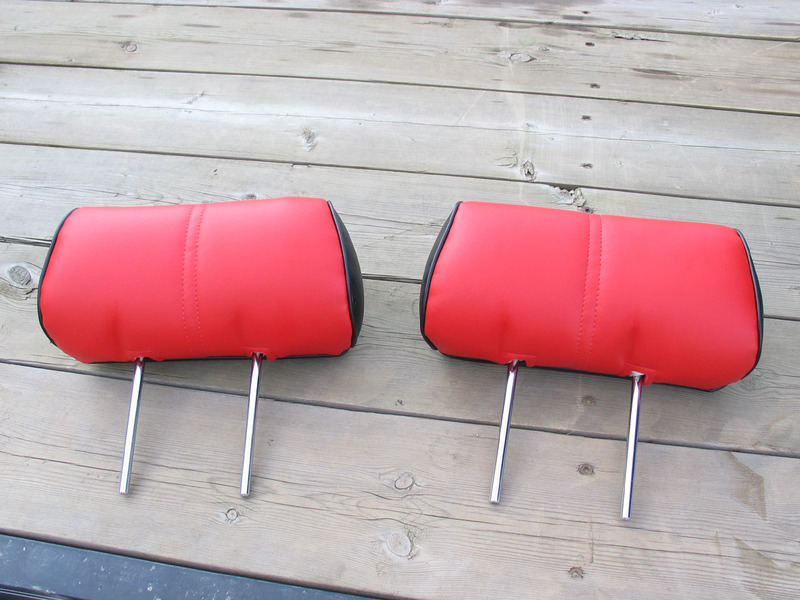 The look and feel is like no other seat I've ever owned, ridden in, or even seen. 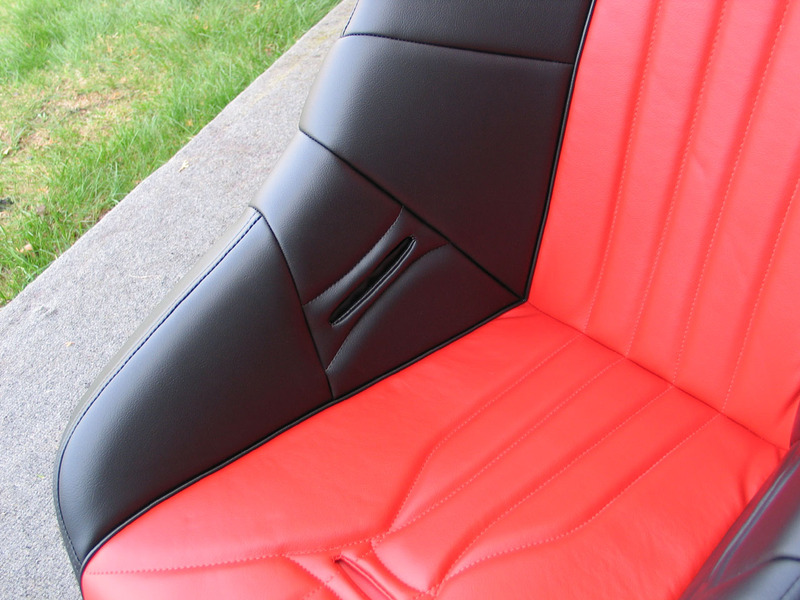 The vinyl actually looks and feels a lot like leather - not at all like the "vinyl" you may think of in an old OEM car seat. 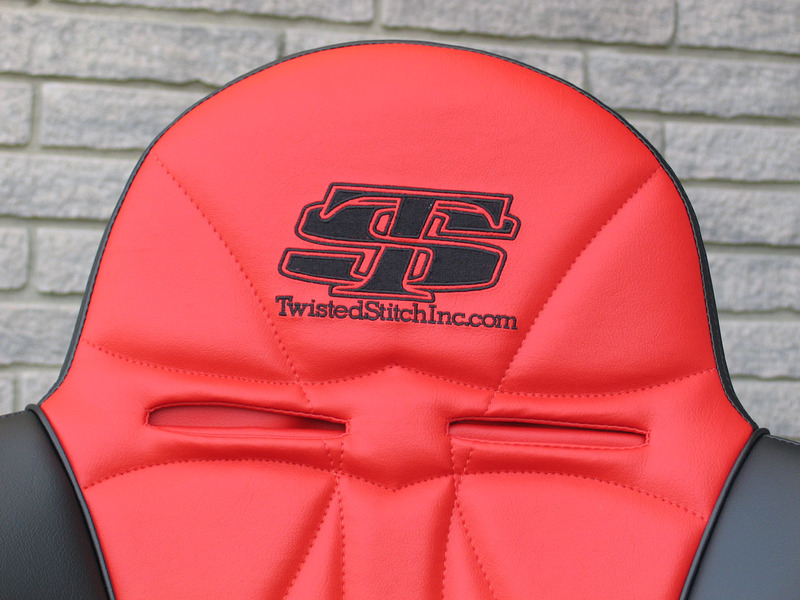 Fixed headrest, shoulder-belt slots, and the Twisted Stitch logo embroidered into the seat. Side bolsters and lap-belt slots. The seat is very deep and long, giving amazing support and a very comfortable, secure feeling. 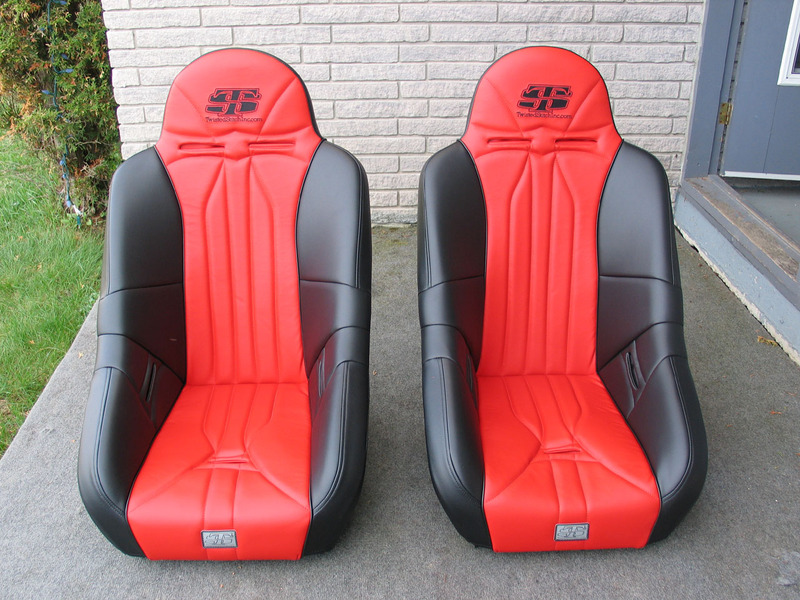 Front seats, side by side. When I said "seats so good you'll want to design a whole rig around them!" 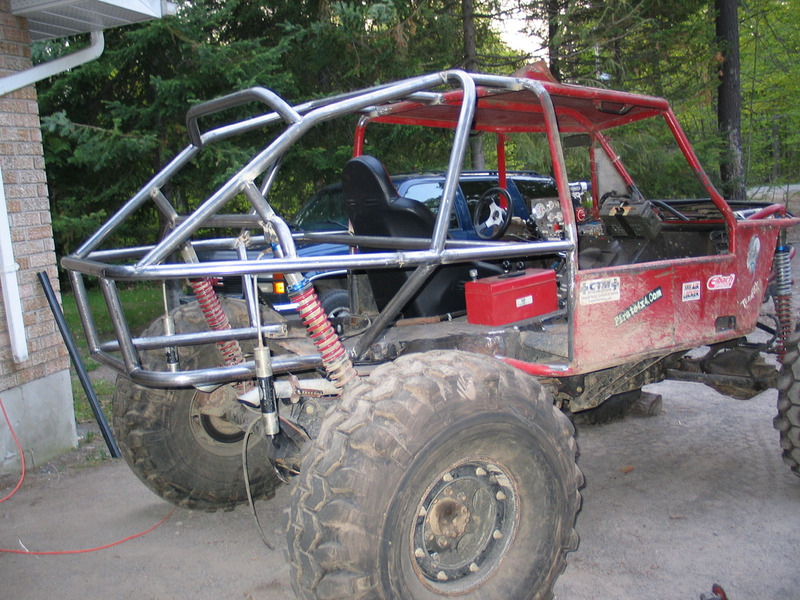 I wasn't kidding. My buggy, the Wolf, wasn't originally designed to be a 4-seater. 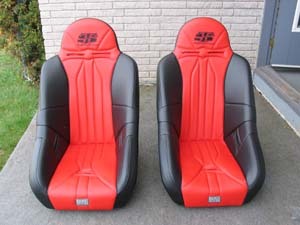 After the kids arrived and were big enough to ride along, I wedged a couple of kiddie seats behind the front seats in something of a booty-fab style. 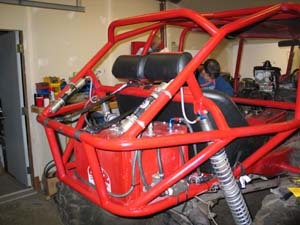 The old original 2-seat design, circa 1997. Booty-fab addition of kid seats. 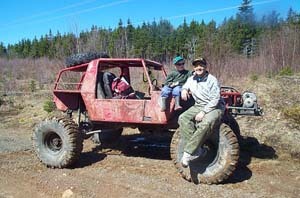 Problem was, there was a lack of headroom, no way to fit even a single adult back there, and the kids grow FAST! 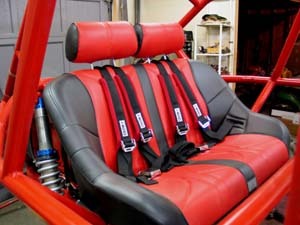 Not to mention no legroom, no storage space, and bad harness mounting! 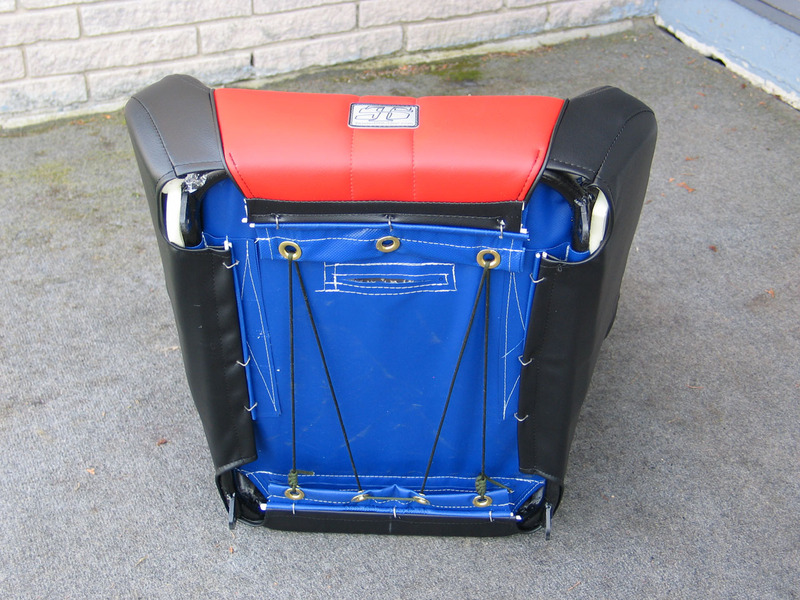 So out came the sawzall and off came the back! 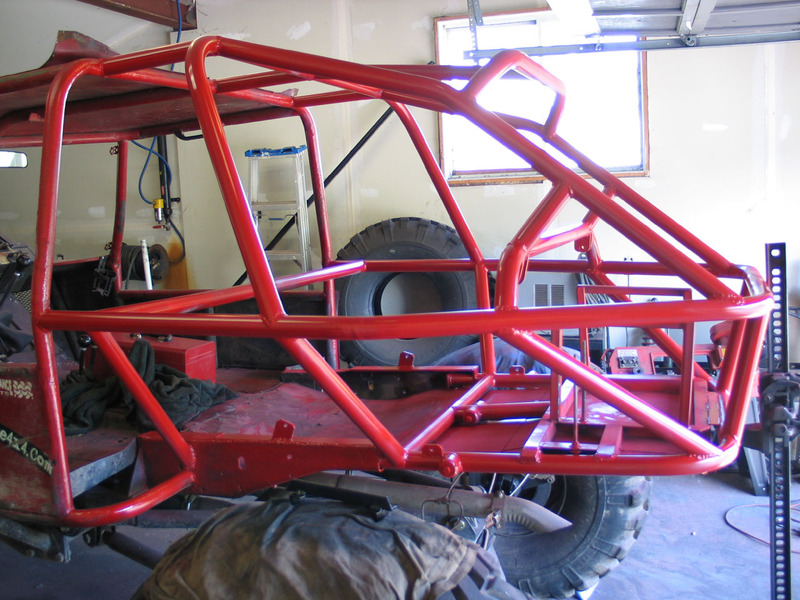 Of course, I decided to do this little project with under a week to go before the season's first big event! 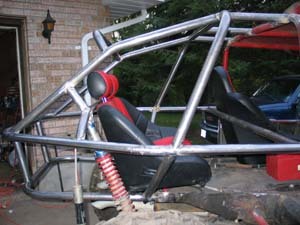 So I took the rig and the shiny new seats over to my buddy Adrian's house and we started bendin' tube! I was so excited I didn't really consider that an un-level dirt driveway is maybe not the optimum location for chassis setup! 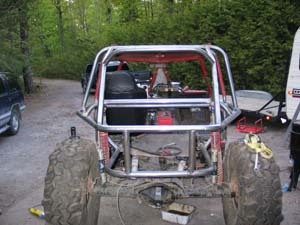 It didn't matter much as there really wasn't a straight panel or tube on the remaining part of the rig to use as a reference anyway! 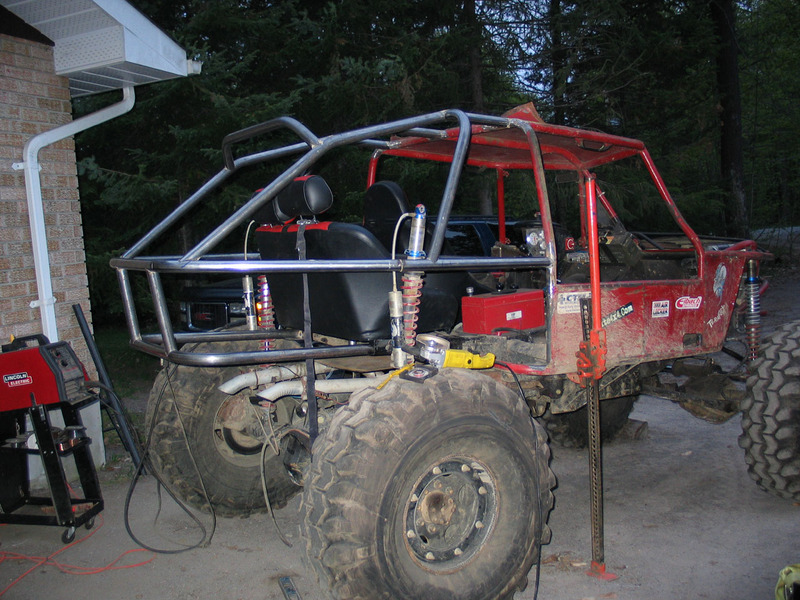 So off we went with a vague idea, an eyeball, some masking tape, and a couple cases of beer. 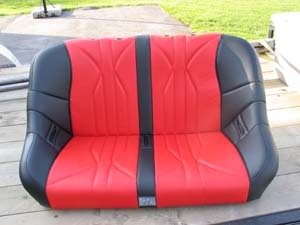 The new bench looks great already! 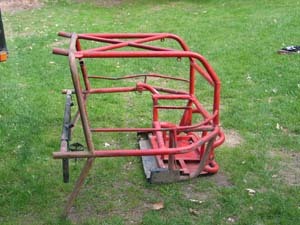 Adrian "Sir Flips a Lot" Weber at work at the bender. 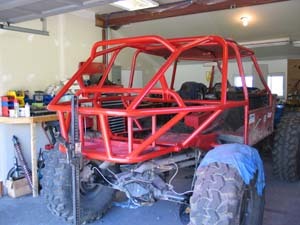 Things are starting to shape up, but damn, it's starting to get dark - maybe we need more than an afternoon for this? My thanks to Mike Hendrix of Hendrix Motorsports for the "lateral hoop over the rear seat" styling cue that I lifted from his awesome X-chassis design. As the rig began to take shape I was really pleased we'd chosen to design around the seats as opposed to trying to stuff them in afterwards. ... and then slipped them under the front mounting tabs to give differing amounts of rake to the seat back. How much rake you want in the seat is a personal preference and something of a compromise. 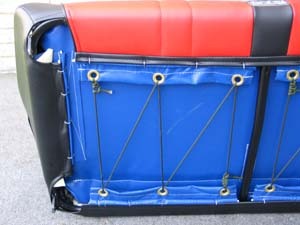 With the "depth" of the Pro seat (from front edge to seat back), I found that more rake gave wonderful thigh support and was very comfortable, but at the highest and most comfortable levels (front mounting tabs 3-4" higher than the rear) the seat was reclined so much that the driving position wasn't great and the visibility from the driver's seat poor, especially with the shoulder harnesses tight. 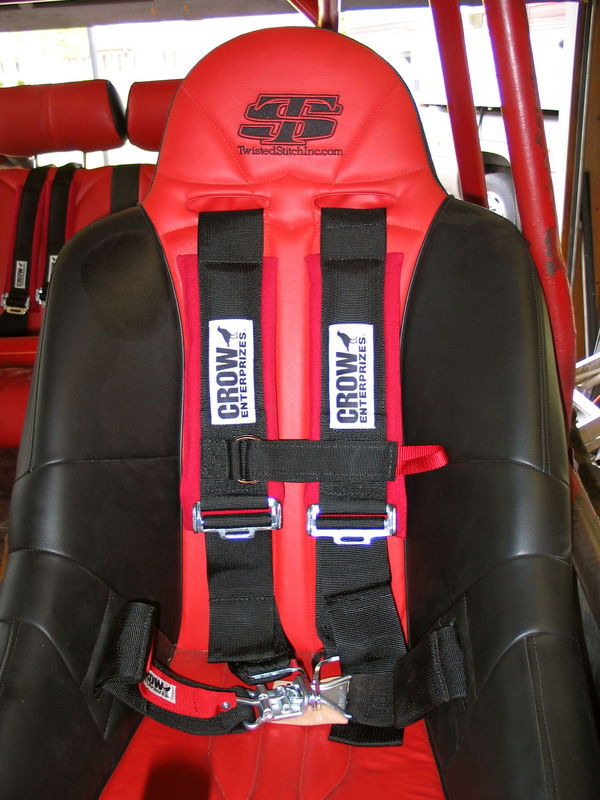 Ultimately I settled on the front tabs 2" higher than the rear, giving good support and comfort but still allowing good visibility and reach when tightly strapped in. 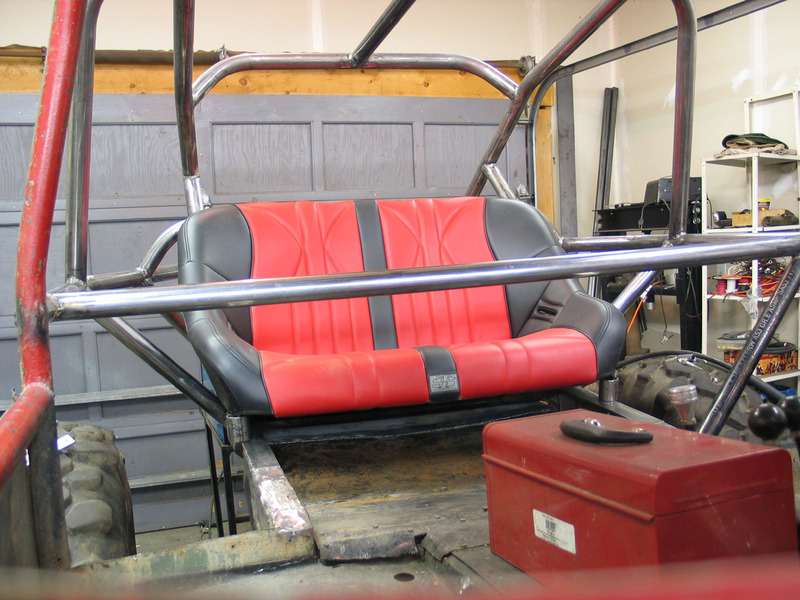 With the rake set and the fore-aft distance from the pedals set, it was time to mock up the crossbar behind the front seats. 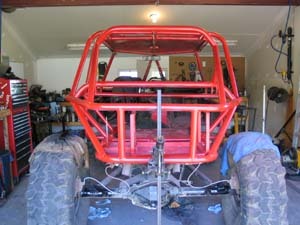 Coming along...oh look - the sun has come up! 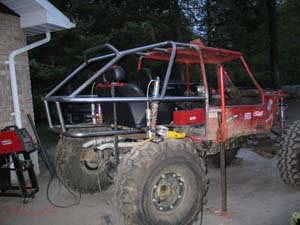 Shocks finally mounted and it's tacked together and sitting on its own suspension again. The rear axle will eventually be moved back about 12", moving the wheelbase from 103 to 115", hence the severe aft rake of the shocks at present. 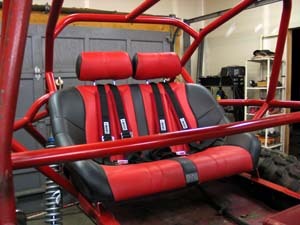 Lots of room for the back seat now. 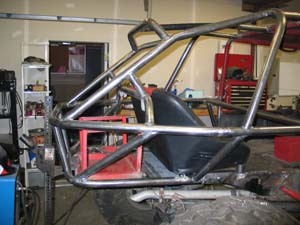 Ready to load up and take 'er home for finishing. 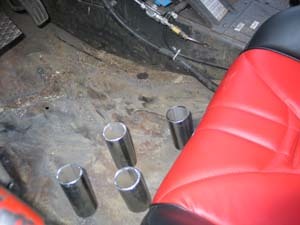 Back in the shop at home for the last few tubes and final mounting of the seats. 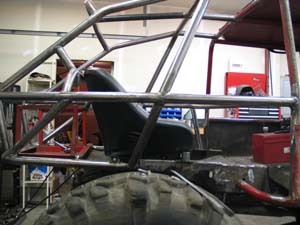 Using the " tubes" to get the angle right. 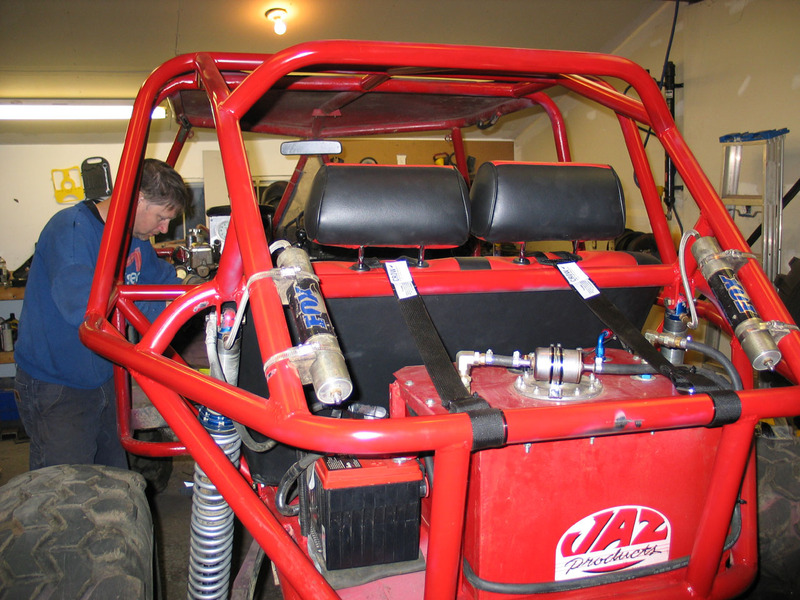 ...and triple check that the fuel cell and everything else will work where the seat is positioned. Chassis painted at about 6am after a 20 hour marathon... 24 hours to go before the big event! 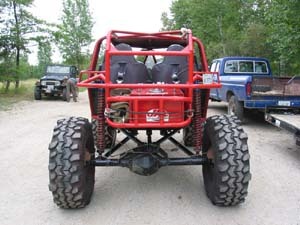 Rear shot of the newly re-designed rear. 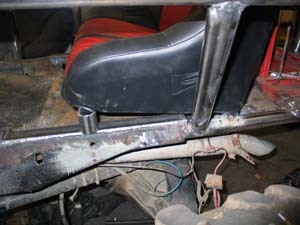 Side shot of the new rear bench in place. 2 am the morning of the big event and my spotter and pit boss, Justin "Buster" Myles is helping me mount the front seats. ...and side shots of the new rear bench. I'm just thrilled with the way the rear bench worked out. 3 am and the driver's seat is mounted! 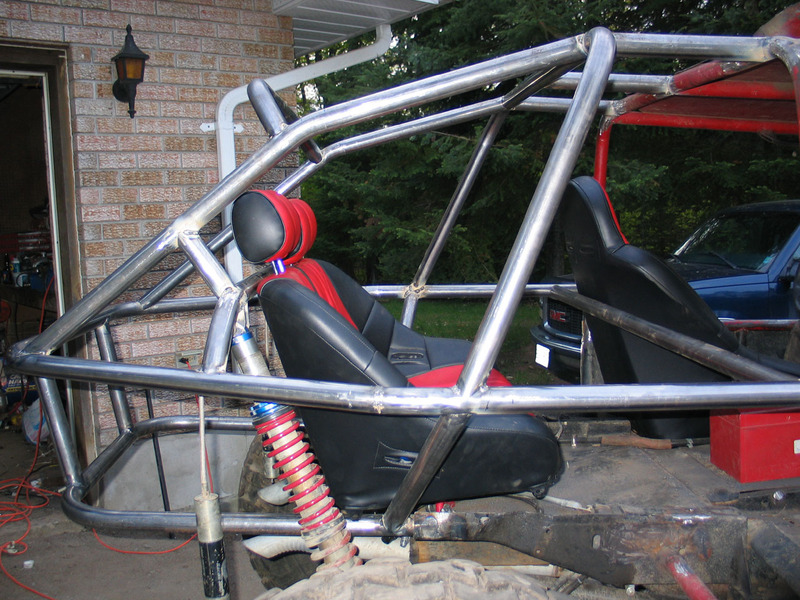 With only the front passenger seat to go we knocked it off at about 3:30 am and I finished the last install the next morning after a couple of hours of sleep. 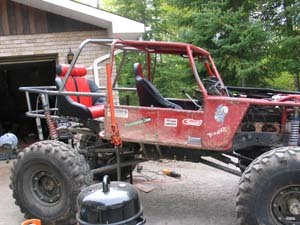 It was damn close but we got it done just in time to leave for the event. The new seats drew a lot of attention and lots of people got to sit or ride in them. 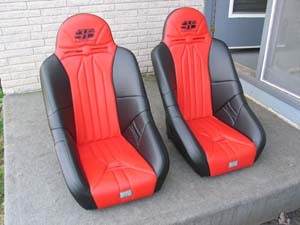 Everyone who sat in them was impressed. I'm 5'10" and 200 lbs (ok, ok - 210) and the regular Pro seats fit me like a glove. 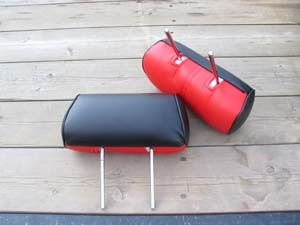 Over the weekend shorter, taller, and stouter folks tried the seats and every one liked them the way they are - snug and secure. 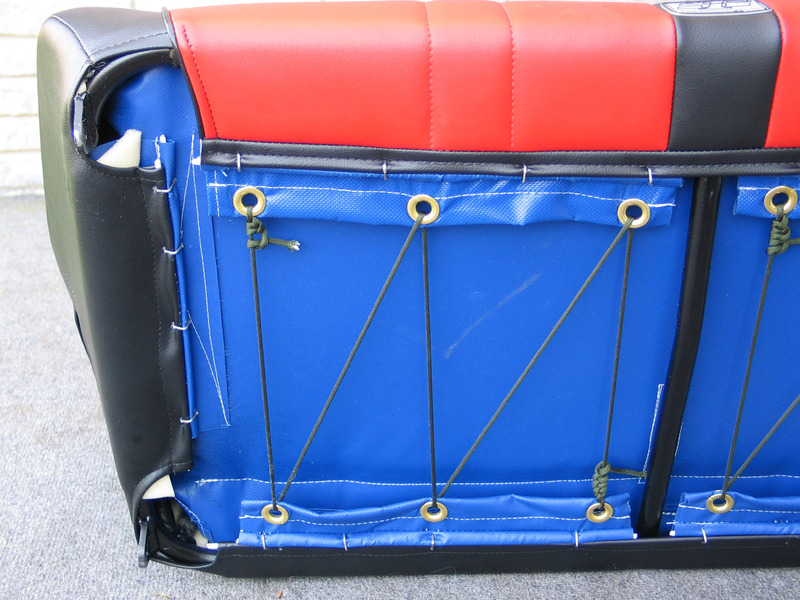 However, if you're a larger person, or just like a looser fitting seat, most Twisted Stitch seats are available in taller and wider configurations. 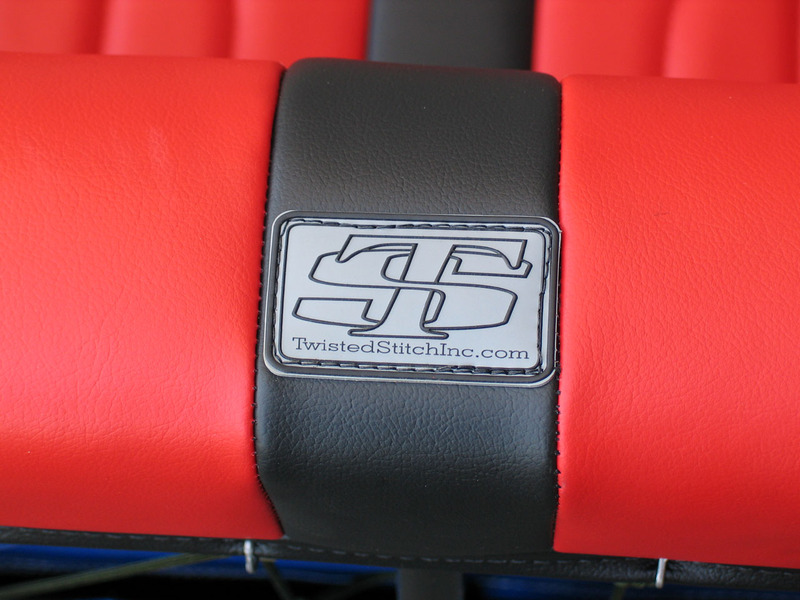 Twisted Stitch, Inc. started from a necessity for high quality, custom ordered off-road suspension seats with a reasonable build time. 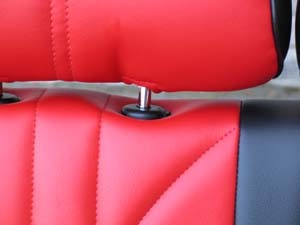 Each Twisted Stitch seat is built to order and is usually ready for delivery within 14 days or less. 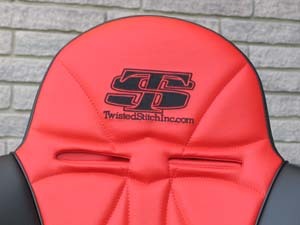 Each seat from Twisted Stitch is built by hand in the USA with high quality materials and workmanship from a staff with over 35 combined years of experience. Twisted Stitch has a seat for almost every segment of the market. 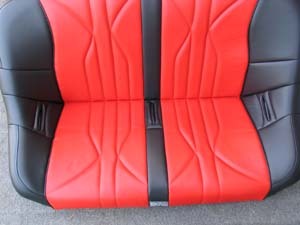 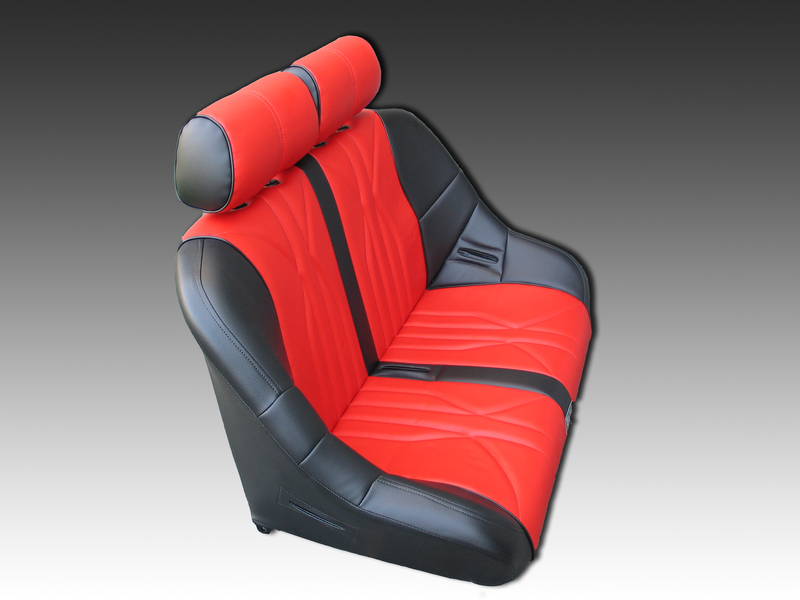 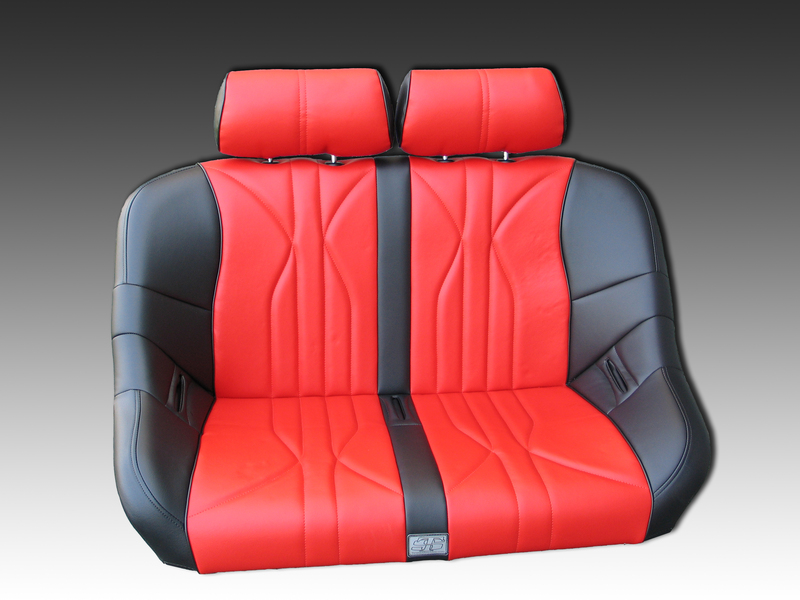 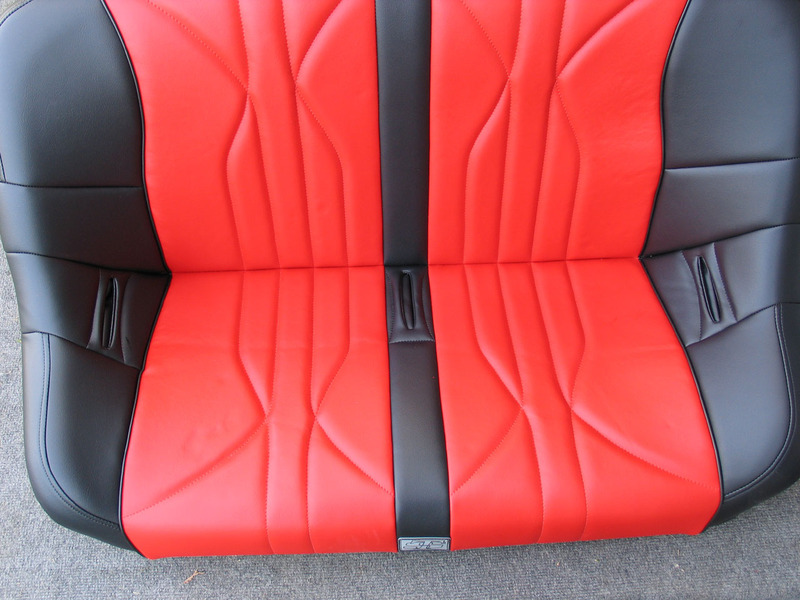 Seat materials include marine grade vinyl, automotive tweed, synthetic suede and leather. 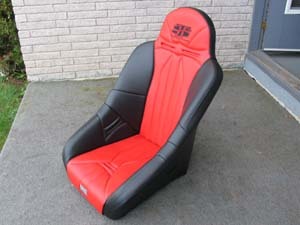 There are thousands of material and colour options. 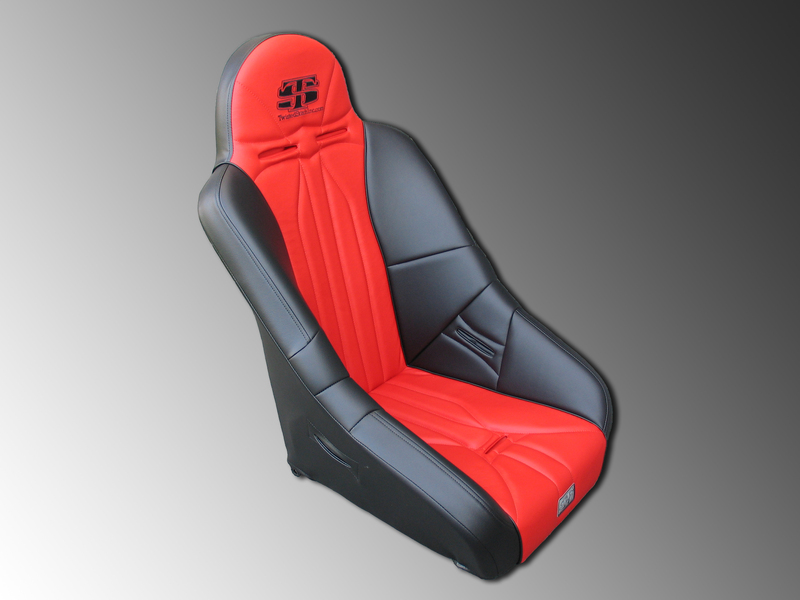 Many of the seats can be customized with options including seat heaters, safety harness slots and loops, headrest choices and custom embroidery. 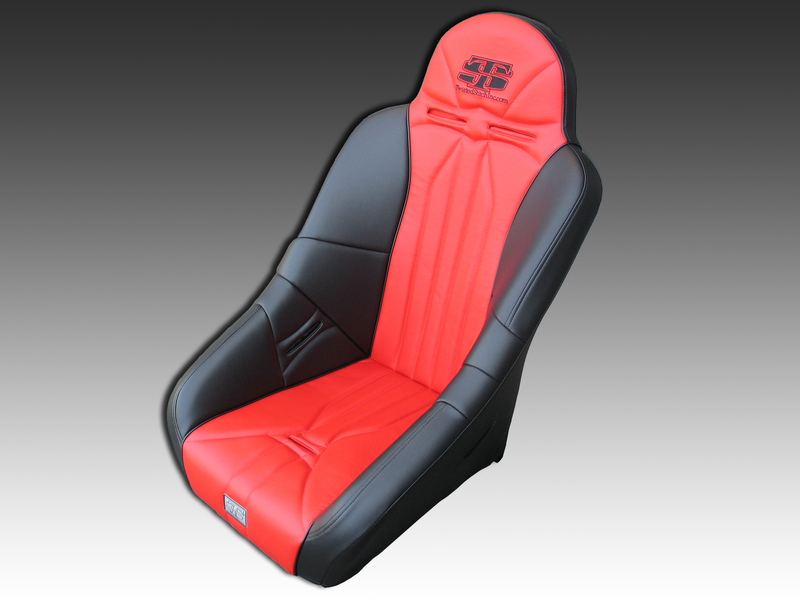 With extra-tall, extra-wide, and short-cushion options, most seats can be tailored to any customer's needs. The following image illustrates the dimensions and panel colour options available. 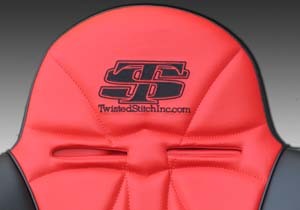 It's an early proof from the Twisted Stitch catalogue so be sure to call and confirm dimensions before ordering. Also note that many seats can be custom-ordered with different dimensions, as with my custom-width 40" Rhino rear bench seat. 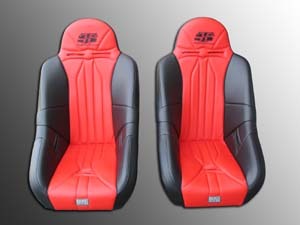 One thing that I noticed is that Twisted Stitch give complete dimensions on the seats, including the interior width, depth and height, and the bolster height (indicated on the diagram as dimensions G, H, I, & J, respectively) which many other companies do not. This is extremely helpful in determining how the seat will fit and feel. 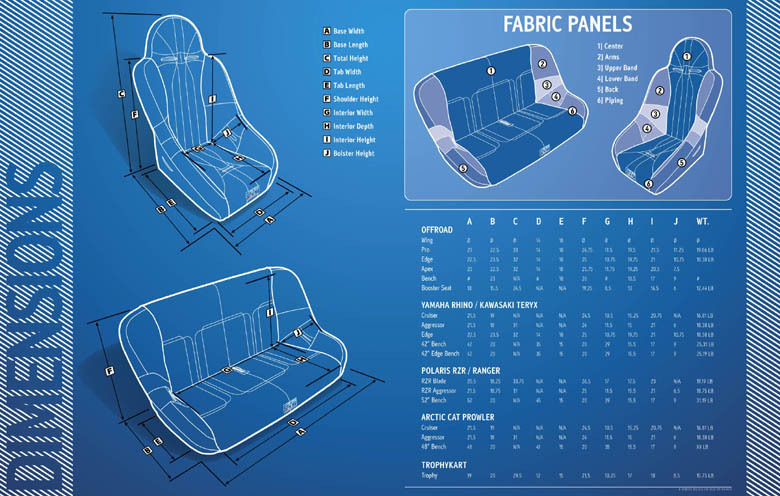 Click the image below to load the full-size version for easier reading. 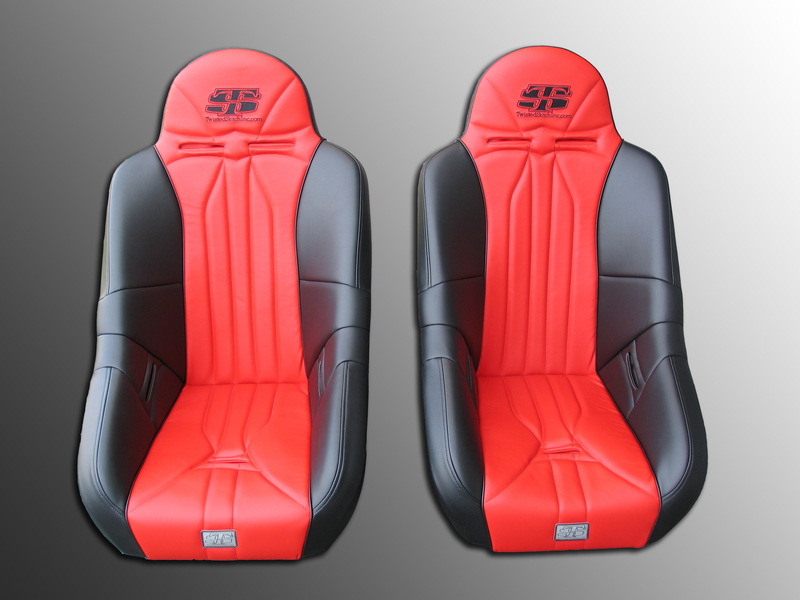 The following pictures are identical to those above, except that I have edited out the background and they each link to a high resolution copy (2592 x 1944) in an attempt to illustrate the true quality and superb appearance of these seats. 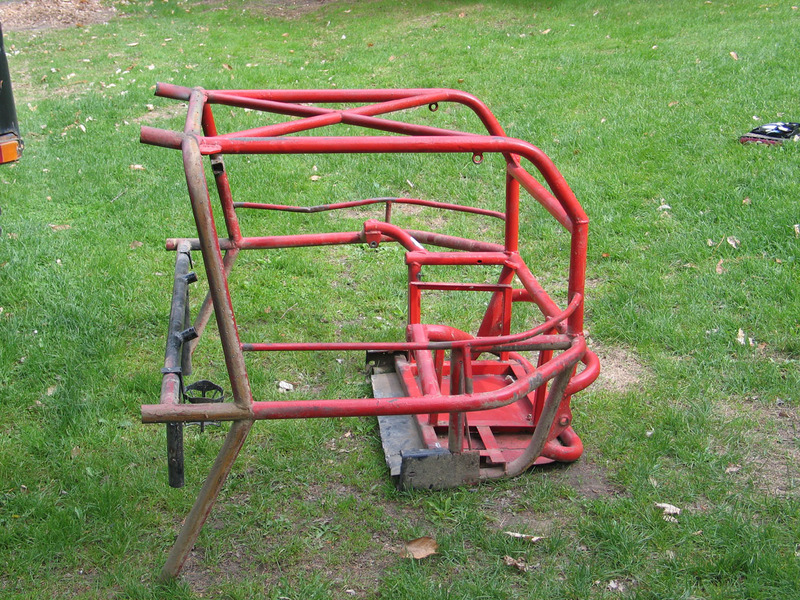 For this entire article I've been doing the literary equivalent of biting my tongue. Why, you ask? Because I know from experience that if I rave and rant about how truly great I think these seats are I'm going to get a couple thousand e-mails from guys asking "do you really mean that, or are you just saying that?". 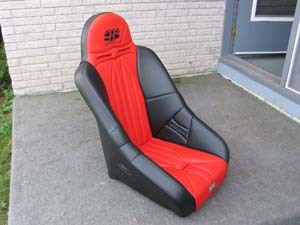 So let me address that right here and now. 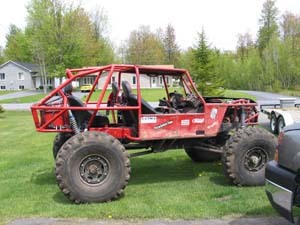 I only ever write what I really mean. 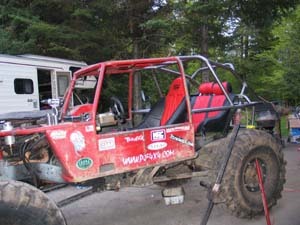 I'm not the "consumer reports" of the 4x4 industry - it isn't my mandate to review every product available and tell you about the good, the bad, and the ugly - I don't have the resources to do that. 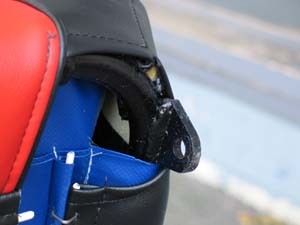 I don't even have the resources to review every product I'm asked to. My mandate is to review and feature for you, the reader, some of the best products available. If I get a product that doesn't meet expectations, you probably won't read about it here - it isn't worth my time to write about it. 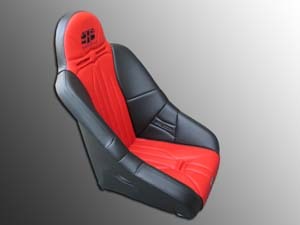 And I have to admit, my expectations are usually pretty high and only a few products meet them. 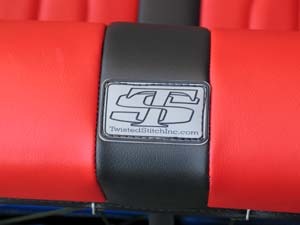 Very, very few exceed my expectations - but these Twisted Stitch seats are just such a rare product. 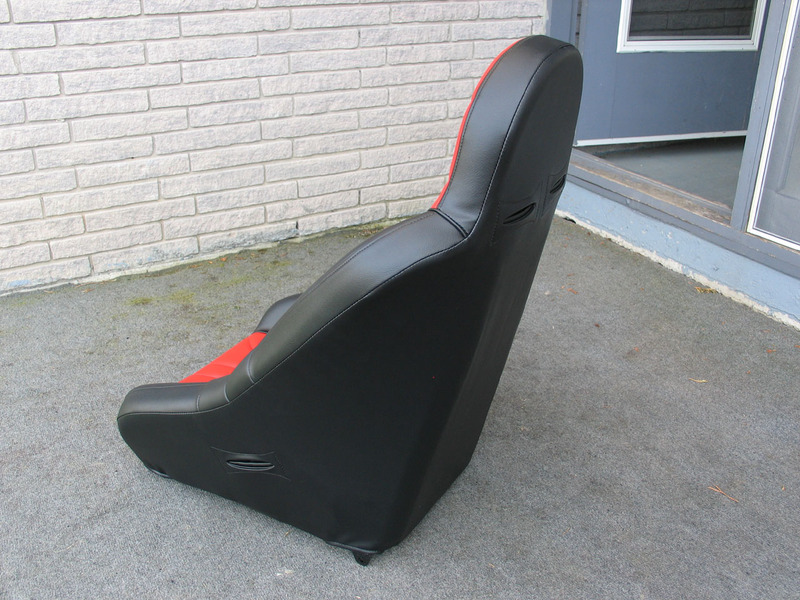 I'm not going to haul out the thesaurus and write out all the synonyms for fantastic, awesome, superior, etc., so let me just say this - these seats are one of the finest products I've ever reviewed. 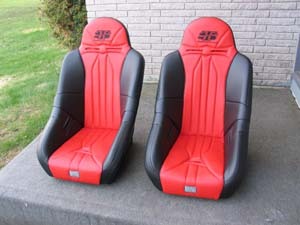 They exceeded my expectations. 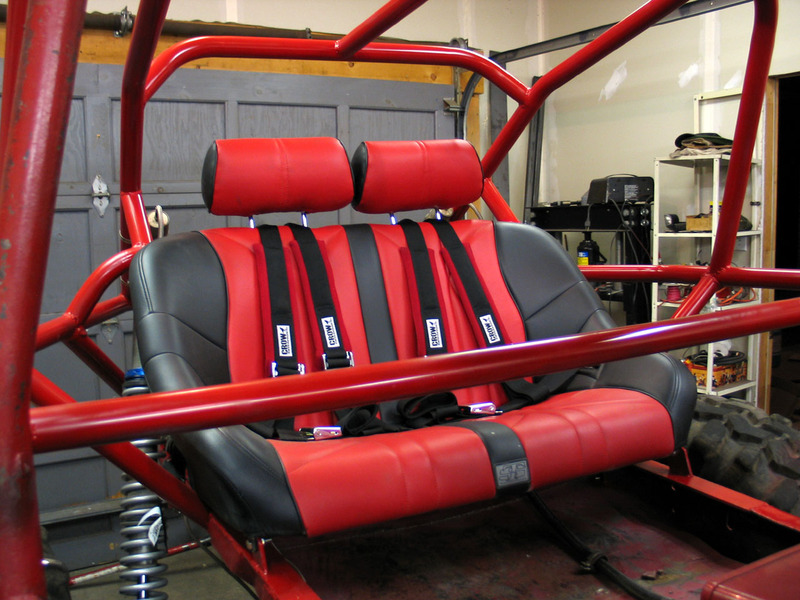 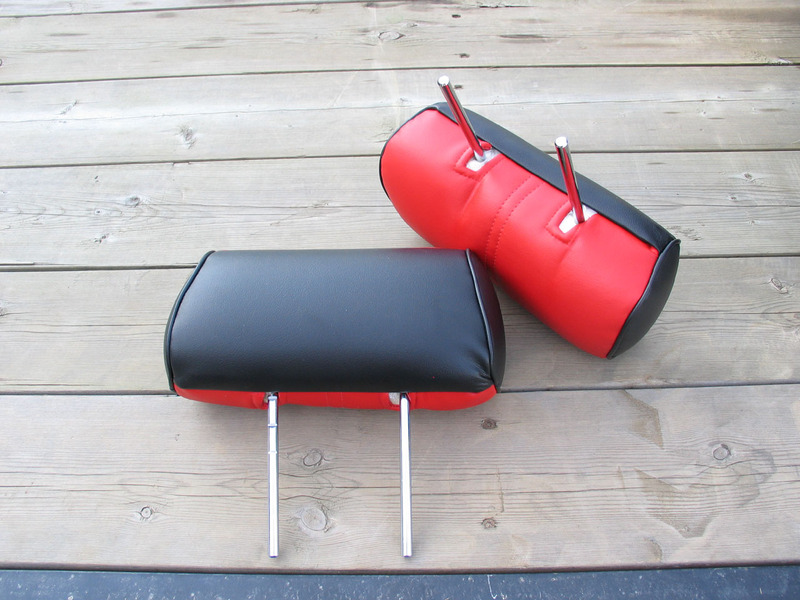 If you're looking for budget seats, they're probably not for you - but if you're looking for absolutely top quality seats that will not frustrate you; if you're tired of poor quality, cheap materials, and sketchy service; if you just want a top quality custom suspension seat built and delivered quickly, then I can assure you that Twisted Stitch will not disappoint you. Period.